Motherhood, mayhem, and mirth: Not really that surprising. Last Saturday night we had Mike's BF, Sean, and his kids over for dinner. The guys took over the kitchen and made a very memorable meal. The guys decided to have garlic bread and I was expressly sent as far away from the oven as possible. If you have ever been to my house for dinner, you know I ALWAYS burn the bread. ALWAYS! This is an ongoing joke. See, even when I'm not making garlic bread, I still manage to burn it! Apparently, whoever was in charge of the bread put it in the oven and then promptly forgot about it. I think it might actually be my oven's fault. I'm no longer taking the blame. 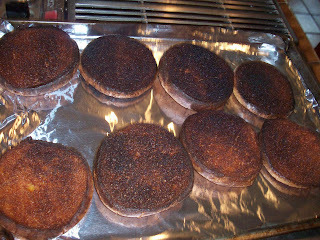 The oven emits some sort of mind altering drug the instant bread is set inside which makes the person in charge FORGET! You know what my mom's oven has that same function but it is for those easy brwn and serve dinner rolls that you serve at holidays. Neither of us learned our lesson the first time.